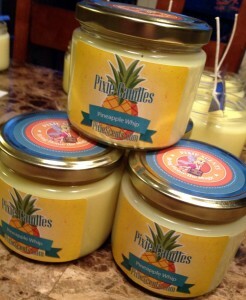 I make the Pixie Candles & Pixie Cakes (Wax Tarts) with 100% soy and it’s the best soy available. This gives the candles a more fragrant smell than traditional soy candles so when you light it, it will take you back to that magical place. Even the candle wicks used are special. They are natural and burn clean and slow. Each candle is hand poured by me, my Mom or my Dad. We craft them on the kitchen table one by one. So they are very limited and with school and my parents work we can only make small amounts. I go with my Mom and Dad on some really fun vacations and the smells captured in the candles and tarts that we make bring me back to those places instantly. Some are favorite foods or favorite rides or even the hotels have certain smells I like. I will post on our Instagram account when a new candle or tart (Pixie Cake) is coming out so you can be ready to order them if you like so you are sure to get one.